Just a few blocks from Haywood St. in West Asheville, Rhodes Waite’s backyard doesn’t stand out from the street. 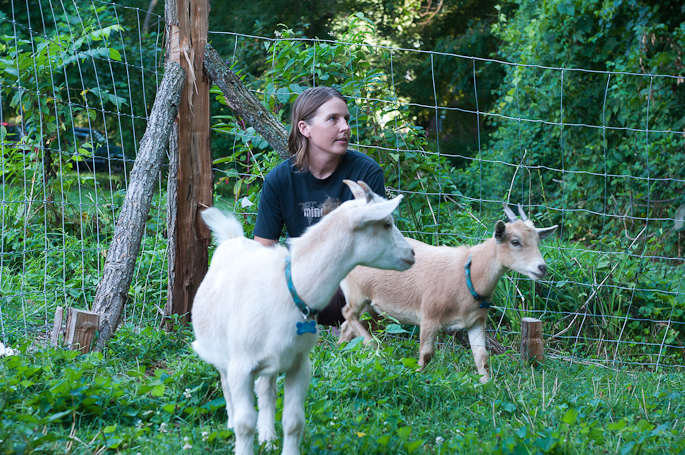 But while her neighbors mowed their lawns and checked their mailboxes, Waite opened her back gate to welcome Freeskool Asheville visitors into her goat yard. 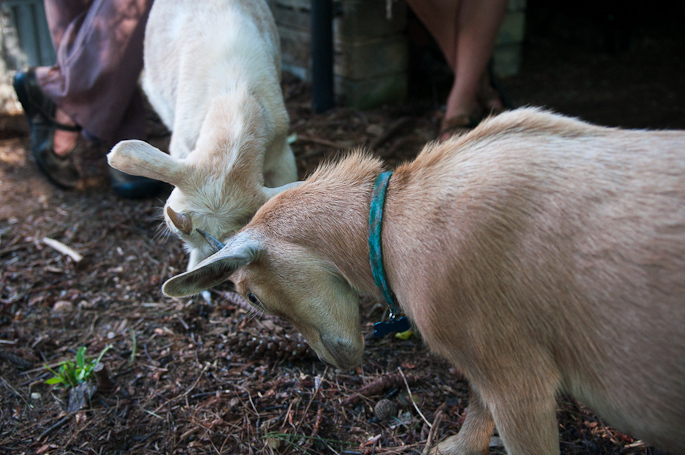 Two pigmy goats, about a foot and a half tall each, clamored against the fence while people crowded around, marveling at their tiny horns and hoofs. 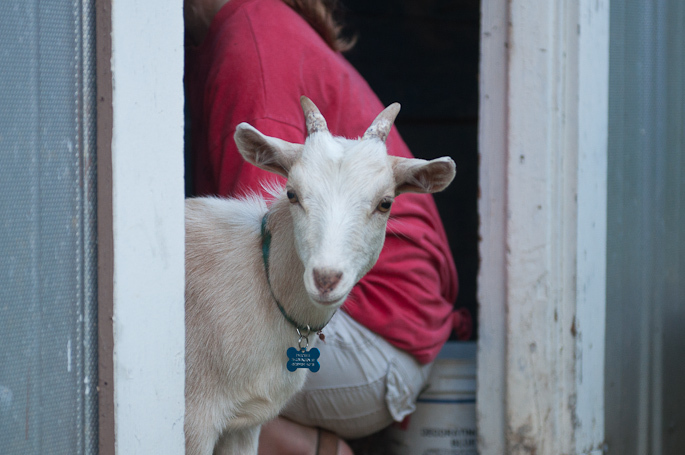 Pygmy goats can be surprisingly quiet, especially when confronted by a reporter. After several attempts, there was a brief retaliatory microphone attack. 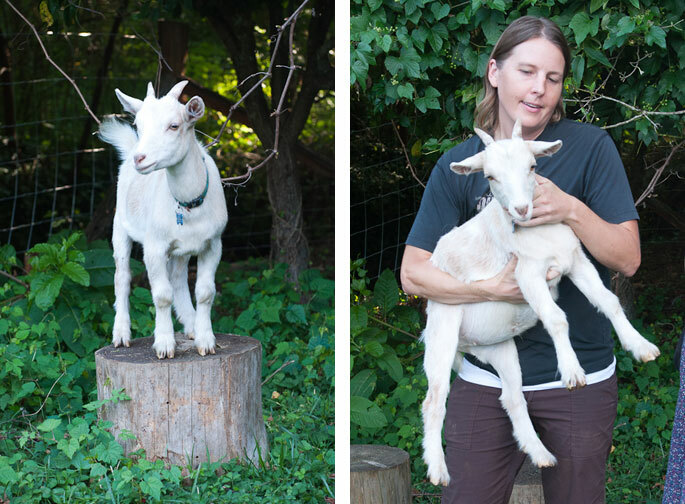 Hear Patches and Nibbles for yourself and remember: while their bleats may be small, their personalities are big. 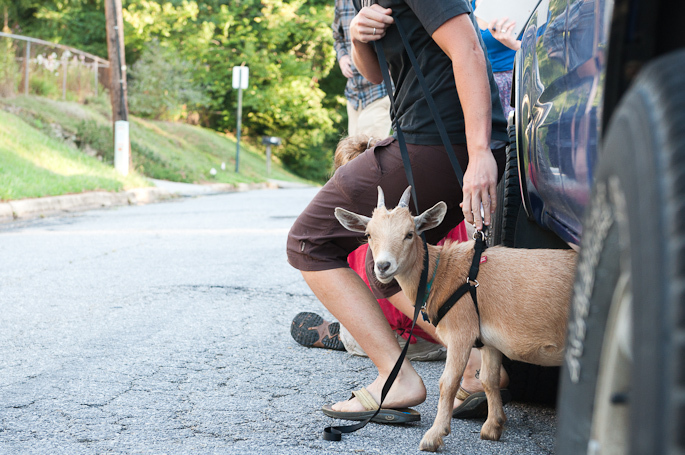 Like chickens, goats are allowed in the Asheville city limits with a special permit. According to Ordinance No. 3731, up to six animals per household are permitted at one time, with the exception of animals that are kept on a multiple animal permit. 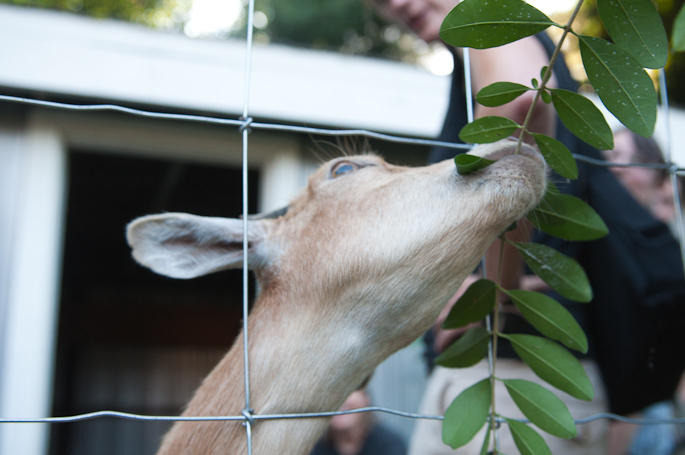 Animals are defined as cats, dogs, rabbits, fowl, chicken, horses, cows and yes, goats. 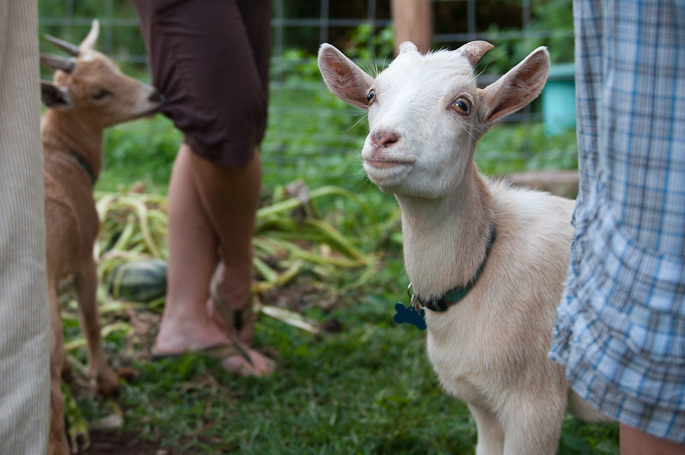 Goats require a livestock permit and must be kept 100 feet away from neighbors, not too difficult for some spacious city lots. 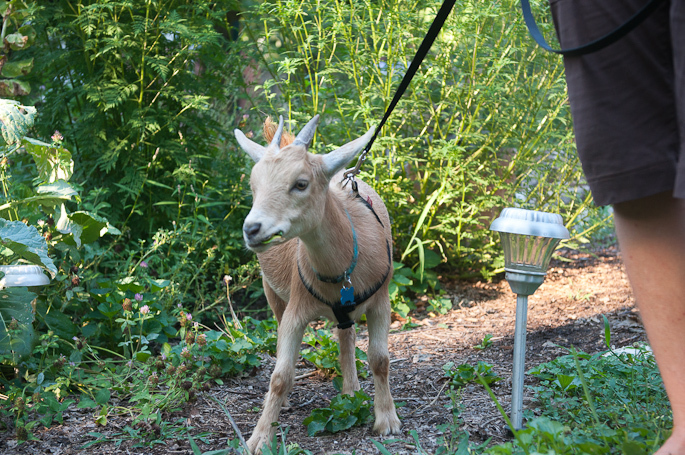 Patches and Nibbles went for a short walk down the driveway, in collars and harnesses, of course. Other than a small fear of cars, they were very polite and well behaved. 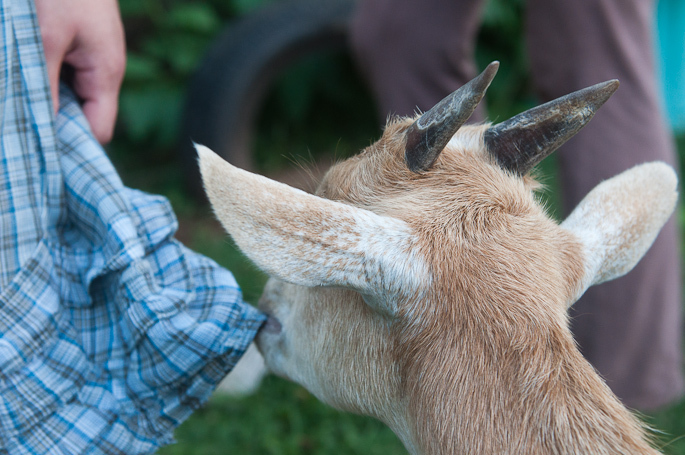 Goat’s milk cheese anyone? 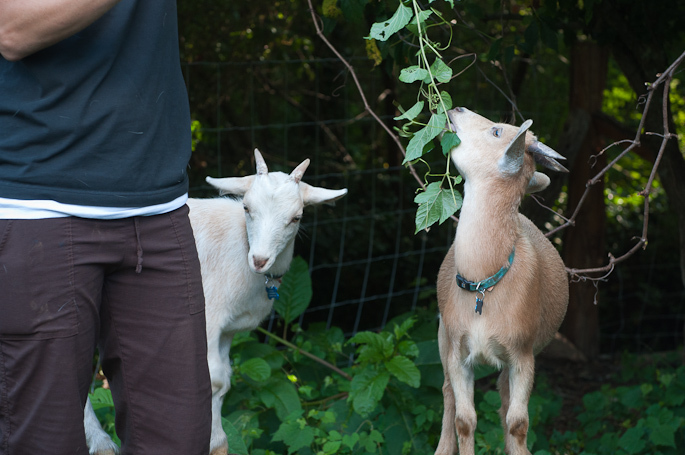 Nice looking goats!